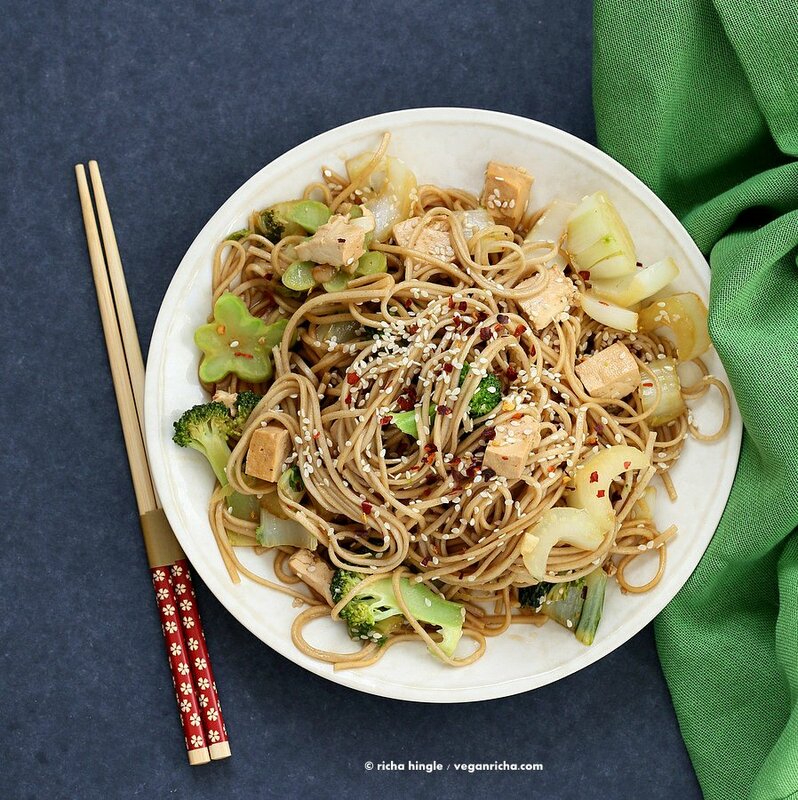 This Easy Tofu Broccoli Bok Choy Stir fry with garlic sesame soy sauce and soba noodles is a quick fix for weekday dinner. Allergen Information: Free of Dairy, egg, corn, nut. 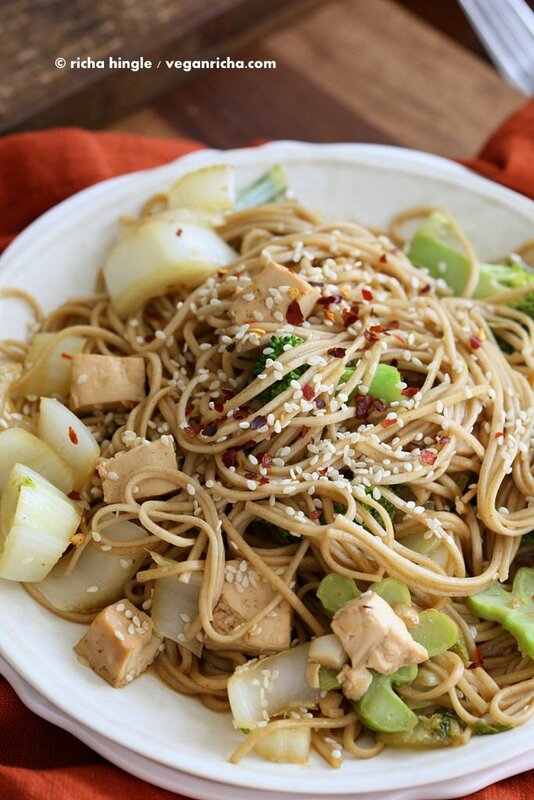 Can be made gluten-free with gf noodles. A super quick weeknight fix today. 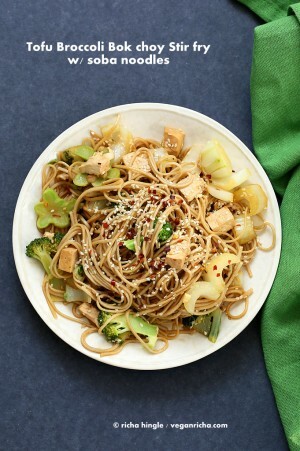 Marinate the Tofu, steam the broccoli and bok choy with garlic, add the tofu and noodles and done! Change up the marinade for variations, use more ginger, use more maple for a sweeter sauce, add some orange juice for a citrusy sauce and so on. Some years ago in some non tofu life, in a far away location (read Seattle), I would take out all of the Tofu from any dish that was served and eat the rest. I would always replace the Tofu with extra veggies if that was possible, whenever we ordered out. I mean, we, especially I do not need to eat tofu to be vegan. Enough beans and lentils show up in every single meal! It does however help to warm up to it for dining out. Over the recent year or so, I have discovered, like many many others, that it really depends on cooking and flavoring up the piece of white throat clogging thing. For a while, the only way I would eat it would be in my super quick Palak Tofu recipe. Things have so changed since then. Here is a super quick stir fry, Marinate the tofu for as less as 15 minutes to as long as overnight. Longer the better. What is your favorite stir fry with Tofu? More quick dinners from the blog. See those flowers, they are thinly sliced broccoli stem. Peel and slice the stem and use. In a shallow bowl, mix all the ingredients under Marinade(except tofu). Add cubed tofu and let sit for atleast 15 minutes to a few hours. Longer the better. Prepare the Soba noodles according to package instructions and keep aside. Heat oil in a large skillet at medium heat. Add garlic and cook until golden. Add the broccoli florets, broccoli stem, bok choy and 1/4 cup water. Cover and cook for 2 to 3 minutes or until bright green. Add the Tofu along with the marinade and cook for a minute. Add the noodles, pepper flakes and mix well. Cover and cook for 2 minutes or until heated through. Sprinkle sesame seeds and serve hot. Looks good! I used to hate tofu. Like you, I discovered that it really depends on how it is prepared. Made the right way, I love it. Made the wrong way, well . . . yuck. I never HATED tofu, just barely ate it. I used it for ricotta replacement and creamy bases, but never in a dish in cubes. Until I tried pressing and baking it. Tofu can be amazing if prepared properly! I am now on a tofu craze. I am not crazy about it yet. maybe one day. 🙂 i do like it as ricotta replacement and in some other forms like mousse. Can you please elaborate these “mix all the ingredients under Marinade”? dimple its the maple, sesame oil, soy sauce, garlic and ginger under marinade. mix them all up, then add tofu. i do what you used to do with tofu. i have definitely eaten well prepared tofu before and enjoyed it, but it never sits quite well in my stomach. This looks amazing! I love that the stem slices look like delicate little flowers. This dish looks great! Will have to try it soon. It took me a while to love and appreciate tofu as well – marinating it is key! 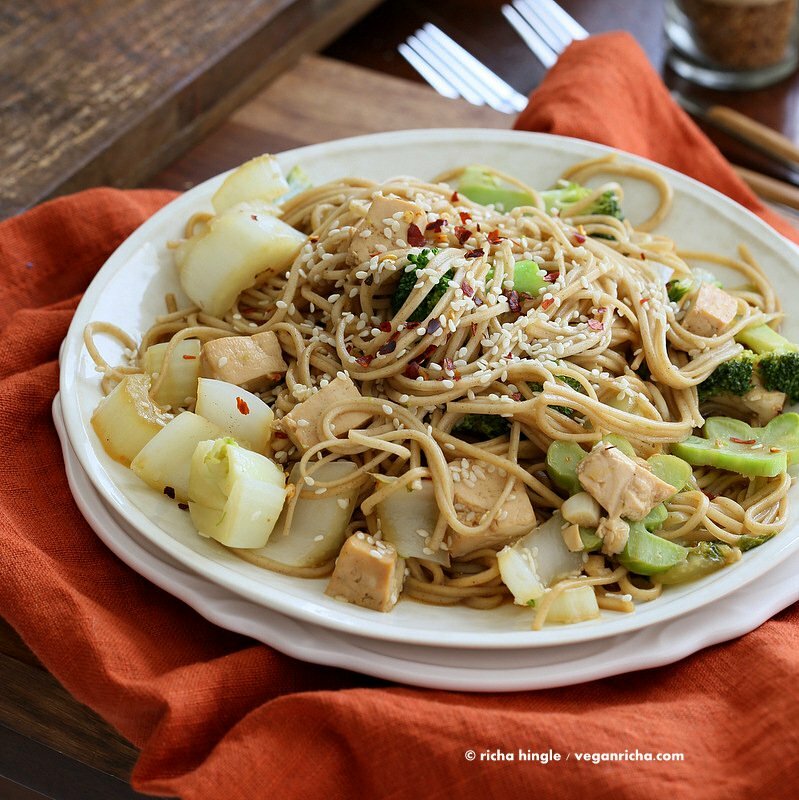 I love the look of this stir fry and can’t wait to try it. Those broccoli flowers are absolutely adorable! 🙂 Pinned! Another fantastic meal! Made w/homemade chickpea tofu because cutting back on soy. Added mushrooms & onions w/gluten-free noodles. Yummy! A different Nina haha… Anyways, I love those flowers made of broccoli stem. I always hate it when I throw the stem away, because I try not to waste anything. I just never know what to do with it. Now I do! LOVE this recipe! I tried replacing the soba noodles with zucchini noodles. amazing! I really love your blog. When I first visited your website I just couldn’t decide what to try first. So, yesterday, when I came back from work very late I looked out for a very quick and easy receipe and found your broccoli garlic dish. WOW! I had no soba noodles at home, so I took spinach flat noodles. I had no pak choi, so I went for broccoli only. And I took fresh garlic and ingwer for the marinade instead of granulate and powder. Turned out very soupy because the water releases from the veggies and there is the extra water. The tofu was mush, it should be be cooked separately and then added when the veggies are done. Tasty marinade! you can add less water and cook uncovered over medium high heat for 2 mins or so. the liquid depends on the veggies and tofu. Hi Richa! The recipe looks lovely, but I don’t see a printer friendly version. Will that be forthcoming? This was great! I added green pepper and onion, made rice instead of noodles, and it was still wonderful. The pan was a little crowded with all the veggies so I put them in a bowl when they were done so I could sauté the tofu properly, then I added the veggies back in and threw in a little jarred chili garlic sauce. I have recently began cooking vegan and I am looking forward to making more of your recipes! This was our dinner tonight and it was delicious. Added a few extra veg but that is always good. Maybe one day I’ll actually remember to take a picture of what I make. Thanks for all your great recipes. Just had this for dinner, only modification was more chili flakes as we like the heat. It was so simple & tasty. We only had time to marinade tofu for 15 minutes but will do the overnight option next time 🙂 Seriously tasty!